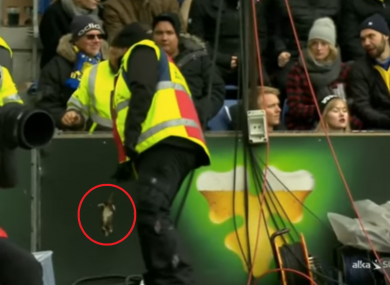 A steward removes a rat from the pitch. BRONDBY ARE TO investigate after dead rats were hurled at Copenhagen players during a Danish Superliga clash between the sides on Monday. Hosts Brondby were trailing 1-0 in the 85th minute of the match when the rodents rained down on Copenhagen full-back Ludwig Augustinsson as he prepared to take a corner. Copenhagen won the match to move 13 points clear of their fierce rivals at the top of the championship group. “We are obviously annoyed that we had to leave the field without points, but it is equally unfortunate that there are some visitors for today’s match who could not figure out how to behave properly,” said sporting director Troels Bech in a statement addressing the throwing of “missiles”. “We will now look at all the video material and pictures… [and] will engage in dialogue with groups of supporters in the hope that together we can identify the right person and make sure he/she gets banned from the stadium. Email “Dead rats hurled at Copenhagen players during Brondby clash”. Feedback on “Dead rats hurled at Copenhagen players during Brondby clash”.